Did the experts really predict a post-Brexit recession? There was a moment after the Iraq war when we were waiting for the allies to uncover the weapons of mass destruction stockpiled by Saddam Hussein. While the generals asked for more time — they would turn up eventually — some brave souls like Robin Cook, called it correctly; they were never there in the first place. Waiting for the post referendum recession feels like waiting for Saddam’s WMD. Last May we were told that the Bank of England, the Treasury, the IMF and others forecast an imminent recession if Britain voted to leave the EU. It is not surprising that many remainers are still expecting an economic catastrophe while smug leavers feel their distrust of experts has been vindicated. Robin Cook knew early on that no WMD would be found because he had paid close attention to the original evidence. A careful reading of the economic evidence would have shown that the recession story was just as over hyped. While Mark Carney, George Osborne and Christine Lagarde were all reported as predicting a recession, their organisations’ analyses said something else. The Bank of England’s Inflation Report in May 2016 pointed to the downside risk of a leave vote including ‘a materially lower path for growth and a notably higher path for inflation’. The press conference is a classic example of reporters in pursuit of a preconceived story. He emphasised that the Bank had made no formal forecast but the press had their headline. Misleading reports of the Treasury forecast should not be blamed on the press. ‘Scrupulous with the truth’ is not a quality we associate with George Osborne. Indeed the BBC deserves credit for fact-checking the recession claim. The Treasury analysis included a ‘shock’ scenario and a ‘severe shock’ scenario. The latter included as a kind of sensitivity analysis. Under the first GDP would be 3.6 per cent lower and under the second, six per cent lower after two years. A 3.6 per cent fall in GDP would be a major recession and a six percent fall would be another great recession. That is not the Treasury claim. A close reading of the document shows that these are projected falls from a ‘baseline’ case where Britain voted Remain. Since the economy normally grows by more that 3.6 per cent in two years the shock scenario is not obviously a recession. More significant is that the Treasury has no figure of its own for the baseline. The Treasury analysis does not give an independent estimate of the level of GDP after a leave vote. In order to deduce a recession it switches methodology to subtract its estimate from the OBR forecast. This allowed a conclusion of four quarters of growth at -0.1 per cent. Even if we were prepared to accept that manoeuvre the report makes the unrealistic assumption that, faced with a downturn there would be no fiscal or monetary response. The smallest stimulus would surely nudge that figure into positive territory. 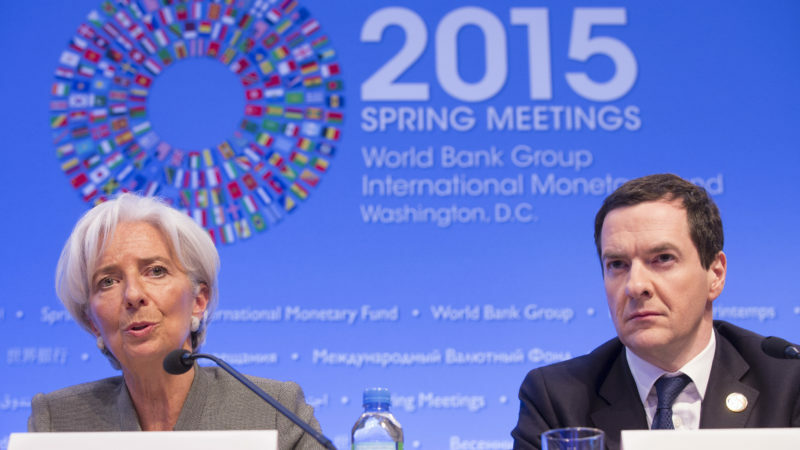 The IMF also provided warnings of a post-vote recession. It too offered two scenarios. 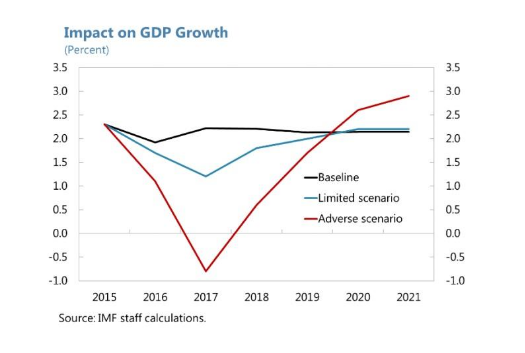 In the limited scenario GDP would fall by 1.5 per cent by 2019 and in the adverse scenario by 5.5 per cent over the same period. Again these are falls relative to a baseline of GDP after a remain vote. Tracking down the relevant IMF staff report uncovers this useful graph. In one scenario growth dips but remains a long way from recession, in the other a recession is visible. Firstly, the idea that there was a confident consensus that a leave vote would cause a recession is wrong. In each case the possibility of a recession was acknowledged but given too much emphasis in the reporting. A closer look shows that the Bank was not making a forecast, the IMF was more nuanced and the Treasury report lacked credibility. Secondly, even taking account of the exaggerations, it is clear that most analyses expected a greater negative impact than has so far occurred. It may have been correct to warn of the risks which conventional economics would identify. We avoided those risks and should be relieved. Investment and consumer spending, for example, have continued better than expected. Risks remain but they should probably be set in the context of the wider state of the economy – household leverage, low productivity and stagnant incomes. EU exit is not the only factor.